Motto: "A City of Charm And Tradition"
U.S. Highway 14 and Minnesota State Highways 15 and 68 are three of the main routes in the city. The first white settlers of New Ulm, 1854. The city was founded in 1854 by German immigrants Christian Ludwig Meyer, Alois Palmer, Athanasius Henle, and Franz Massopoust. The city was named after the city of Neu-Ulm in the state of Bavaria in southern Germany. Ulm and Neu-Ulm are sister cities, with Ulm being situated on the Baden-Württemberg side and Neu-Ulm on the Bavarian side of the Danube river. In part due to the city's German heritage, it is a center for brewing in the Upper Midwest, home to the August Schell Brewing Company. The Kiesling House was one of three downtown buildings to survive the Dakota War and is listed on the National Register of Historic Places. In the Dakota War of 1862, the city was attacked and burned by Taoyateduta (Little Crow) and his Dakota Sioux warriors. On July 15, 1881, New Ulm was struck by a large tornado that killed 6 and injured 53. 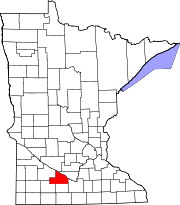 During World War II, German POWs were housed in a camp to the immediate southeast of New Ulm, in what is now Flandrau State Park. In 1944 a New Ulm family was fined $300 for removing a prisoner from the camp, housing him and taking him to church. The Historical Museum is housed in the old post office building, listed on the NRHP. The Hermann Monument in New Ulm dominates the Minnesota River valley from a hill overlooking the city. Inspired by a similar monument called Hermannsdenkmal near Detmold, Germany, this figure served as a symbol for members of the Sons of Hermann, a fraternal organization of German Americans. In 1885, the 362 Sons of Hermann lodges across the country committed themselves to the construction of a monument representing their cultural heritage. Through the efforts of Minnesota’s 53 Sons of Hermann lodges, the monument was built in New Ulm, home to many German immigrants. The sculptor chosen for this project was a German sculptor from Ohio, Alfons Pelzer. A delegation from New-Ulm visited Ulm in 2009 and actually went up to the Teutoburger Forest and Detmold in the North of Germany to commemorate the 2000 year anniversary of the Varus battle, when Arminius, a chieftain of the Germanic Cherusci defeated a Roman army in the Battle of the Teutoburg Forest. A monument to German-Bohemian immigration to America is located in New Ulm. It was erected in 1991 by the German-Bohemian Heritage Society to honor the German-Bohemian immigrants who arrived in this area of the US, most by way of a boat landing on the Minnesota River some 150 yards to the east. The immigrants came mostly from small villages, with the largest number from the village centers of Hostau, Muttersdorf, and Ronsperg. Most of the immigrants were Catholic farmers who spoke a Bohemian dialect of German. Inscribed in granite slabs around the base of the monument are the surnames of over 350 immigrant families. Many of these names are still prominent in the region. As more and more immigrants arrived, not all of whom could farm, they settled in the city of New Ulm and some of the small communities to the west and north. The bronze statue that rests on top of the granite base was designed and sculpted by Leopold Hafner, a German-Bohemian sculptor who now lives near Passau, Germany. The monument is located at 200 North German Street and is open year-round. New Ulm has been referred to as the City of Charm and Tradition. New Ulm's glockenspiel is one of the world's few free-standing carillon clock towers. It stands 45 feet high, and its largest Bourdon (bell) weighs 595 pounds while the total weight of the bells is two tons. The bells chime the time of day in Westminster style. In 1962, it was first suggested by the governor that Minnesota develop a museum or Hall of Fame to honor the rich music heritage Minnesota has to offer. In 1990, New Ulm offered its old library building for the hall of fame site. Owing to the area's ethnic music heritage, the New Ulm was chosen. The Minnesota Music Hall of Fame, Inc. was established with categories reflecting the wide variety of Minnesota's musical heritage. Each year in October the museum holds a gala to induct new members into the Hall of Fame, known locally as Minnesota's Grammys. Music was always a part of life in New Ulm, especially with the arrival of the musically-inclined German-Bohemians in the 1870s. However, New Ulm took a major leap to national prominence in the 1920s. Whoopee John Wilfahrt’s successful career opened the door to what became known as “Old-Time” music. After him, other local bands such as those led by Harold Loeffelmacher, Babe Wagner, Elmer Scheid and Fezz Fritsche kept New Ulm well-known around the state and region. They even produced nationally popular recordings. With the opening of George’s Ballroom and the New Ulm Ballroom and the start of KNUJ radio station in the 1940s, New Ulm billed itself as the "Polka Capital of the Nation". For years New Ulm's famous Polka Days were known worldwide by polka lovers. The festival was held each year in July. Polka Bands played on Minnesota Street and people danced and drank beer until well past midnight. Local events held annually in New Ulm have celebrated the German culture through food, music, and beer. New Ulm's Oktoberfest has been celebrated the first two weekends in October since 1981. Bock Fest, often scheduled concurrently with the local festivities for Fasching, has been celebrated since 1987 at the August Schell Brewing Company. The current summer festival, Bavarian Blast, was created as a recent re-interpretation of New Ulm's longstanding festival, Heritagefest. New Ulm was the setting and filming location of the 1995 independent film The Toilers and the Wayfarers, directed by Keith Froelich. The city was a filming location for the 2004 documentary American Beer. It is also the setting of the 2009 comedy New in Town, starring Renée Zellweger and Harry Connick Jr., although the movie was actually filmed in Selkirk, Manitoba. According to the United States Census Bureau, the city has a total area of 10.26 square miles (26.57 km2), of which, 9.92 square miles (25.69 km2) is land and 0.34 square miles (0.88 km2) is water. The Minnesota River and the Cottonwood River flow past the city on their way to the Mississippi River. In 2002, the U.S. Census Bureau released a report showing New Ulm has 65.85% of population with German ancestry, more per capita than any other city in the U.S.
As of the census of 2010, there were 13,522 people, 5,732 households, and 3,511 families residing in the city. The population density was 1,363.1 inhabitants per square mile (526.3 /km2). There were 5,987 housing units at an average density of 603.5 per square mile (233.0 /km2). The racial makeup of the city was 97.8% White, 0.3% African American, 0.1% Native American, 0.7% Asian, 0.4% from other races, and 0.8% from two or more races. Hispanic or Latino of any race were 1.8% of the population. As of the census of 2000, there were 13,594 people, 5,494 households, and 3,554 families residing in the city. The population density was 1,548.3 people per square mile (597.8/km²). There were 5,736 housing units at an average density of 653.3 per square mile (252.2/km²). The racial makeup of the city was 98.10% White, 0.11% African American, 0.15% Native American, 0.46% Asian, 0.03% Pacific Islander, 0.50% from other races, and 0.65% from two or more races. Hispanic or Latino of any race were 1.26% of the population. There were 5,494 households out of which 29.6% had children under the age of 18 living with them, 52.9% were married couples living together, 8.9% had a female householder with no husband present, and 35.3% were non-families. 31.0% of all households were made up of individuals and 14.4% had someone living alone who was 65 years of age or older. The average household size was 2.31 and the average family size was 2.89. In the city the population was spread out with 23.1% under the age of 18, 12.6% from 18 to 24, 25.5% from 25 to 44, 22.2% from 45 to 64, and 16.6% who were 65 years of age or older. The median age was 38 years. For every 100 females there were 95.7 males. For every 100 females age 18 and over, there were 92.2 males. The median income for a household in the city was $40,044, and the median income for a family was $51,309. Males had a median income of $34,196 versus $24,970 for females. The per capita income for the city was $20,308. About 4.6% of families and 6.2% of the population were below the poverty line, including 7.1% of those under age 18 and 10.0% of those age 65 or over. Ali Bernard, 2008 Olympic wrestler, born in New Ulm on April 11, 1986. Kathryn Adams Doty, actress, born in New Ulm on July 15, 1920; married to actor Hugh Beaumont of Leave It To Beaver television show fame. Robert A. Duin, U.S. Coast Guard Rear Admiral, born in New Ulm on September 27, 1924. Tony Eckstein, former Minnesota politician, legislator and New Ulm mayor, born in New Ulm on May 29, 1923. William Engelbert, Jr., first husband of B-picture heroine Lynne Roberts. Wanda Gág, author and artist, born in New Ulm on March 11, 1893. Her childhood home is open to tour. Tippi Hedren, Hitchcock actress, born in New Ulm on January 19, 1930. She was the star of Hitchcock's classic The Birds. John Lind, although born in Sweden, immigrated to the United States and called New Ulm his hometown. He was a successful lawyer and the 14th governor of Minnesota  from 1899–1901. He later served as a United States Congressman from 1903–1905. Harold Loeffelmacher, polka band leader, born near New Ulm on March 14, 1905, organized The Six Fat Dutchmen in New Ulm during the 1930s. His band played polka music all over the United States. Brad Lohaus, retired National Basketball Association player, born in New Ulm on September 29, 1964. August Schell moved to New Ulm from Germany in 1848, starting the August Schell Brewing Company. The brewery is still in business today. He died in New Ulm in 1891. Natalie Denise Sperl, actress, model, singer. Born in New Ulm, Minnesota. Star of cult film "Succubus Hell Bent' among other television shows and films. Former Coors Light Girl. Terry Steinbach, former Oakland A's catcher, born in New Ulm on March 2, 1962. He played on the All Star Team three times and in 1988 was voted the All-Star game MVP. Lenore Ulric, actress and movie star, born in New Ulm on July 21, 1892. Whoopee John Wilfahrt, born on May 11, 1893, on a farm near New Ulm. He became the leader of one of the most successful polka bands in the nation. ^ "2010 Census Redistricting Data (Public Law 94-171) Summary File". American FactFinder. United States Census Bureau. http://factfinder2.census.gov/faces/tableservices/jsf/pages/productview.xhtml?pid=DEC_10_PL_GCTPL2.ST13&prodType=table. Retrieved April 27, 2011. ^ History of the Origin of the Place Names in Nine Northwestern States. 1908. pp. 12. http://books.google.com/books?id=q_lKAQAAIAAJ&pg=PA12#v=onepage&q&f=false. ^ Burnham, Frederick Russell (1926). Scouting on Two Continents. New York: Doubleday, Page and Co. pp. 2 (autobiographical account). ASIN B000F1UKOA. ^ Moniz, Josh. "New Ulm parties at Bock Fest, Fasching". New Ulm Journal. www.NUJournal.com. http://www.nujournal.com/page/content.detail/id/523074/New-Ulm-parties-at-Bock-Fest--Fasching.html. Retrieved March 6, 2011. This page uses content from the English language Wikipedia. The original content was at New Ulm, Minnesota. The list of authors can be seen in the page history. As with this Familypedia wiki, the content of Wikipedia is available under the Creative Commons License.